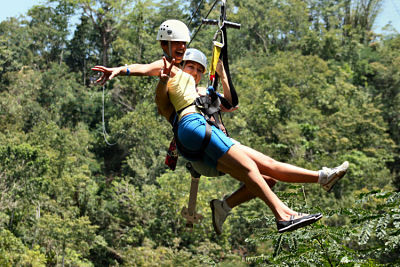 Our Zip Line Canopy adventure tour is a great way to invigorate your senses! Enjoy a breathtaking ride on one of our 5 zip lines, with lengths of 250 to 1,600 feet. Ride above the breathtaking foliage of the islands forestry. This Zip Line Canopy adventure tour allows you to feel the sensation of flying like a bird, soaring over the trees and lush vegetation, with picturesque views of the hills and farmland of the Jamaica, while traveling at speeds of up to 40 mph. Our professional guides will brief you on safety precautions and equipment use. Our Zip Line Canopy adventure tour has a welcome area which features a snack bar, rest room facilities along with tables and chairs for your relaxation. Come join us on this most exhilarating Zip Line Canopy Adventure! Our Zipline tour was great, Garfield is a great driver, he showed us the other side of Jamaican and he was very knowledgeable, we had so much fun while zipping, the view was great and the ride was very exciting, thanks for making my trip great, I will be back for more. Many Thanks. \"See you next year\"